Many people feel that their collections of digital or physical photos and family files are disorganized, and therefore disconnected from full enjoyment in their everyday lives. Organization is very personal, with each individual having his or her own unique flavor of methods, approaches and goals. Although there are no right or wrong answers to how we become more organized, many would like to adopt proven strategies to enable a better state of organization. 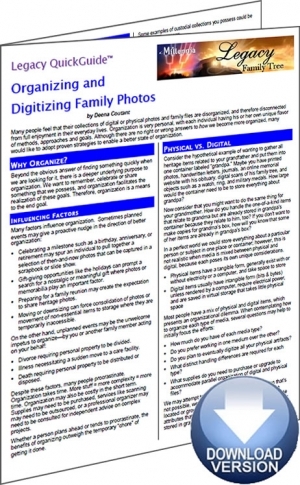 The Organizing and Digitizing Family Photos Legacy QuickGuide™ contains useful information including how to establish collections and repositories, file naming and metadata considerations, methods for proper storage, and more. The five-step organization process describes how to manage digital or physical photos so they can be celebrated and shared. Also included are links to websites and resources covering photo organization and preservation methods. This 9-page PDF guide can be used on your computer or mobile device for anytime access.